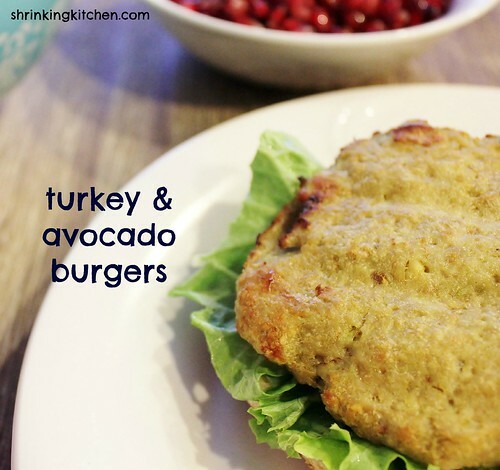 These turkey and avocado burgers are positively delicious! What better way to beat the mid-winter blues than by treating your palate to a taste of summer? Want your kids to eat more produce? Hide some in this burger, and they’ll never know! Our kitchen has been in experiment mode, and last week we played with adding avocado to burgers before cooking. This turkey burger recipe is our favorite for many reasons! Not only do they taste great, adding avocado also adds a healthy dose of Omega 3s and potassium, in addition to other nutrients. With two guests, we were left with one extra burger, perfect for lunch the next day. This is a fabulous meal for picky eaters, and makes 6 big burgers! Serve them on lettuce, or low-carb hamburger buns, then top with tomatoes, pickles … whatever your favorite fresh toppings are. These can be grilled, or cooked indoors. For the most flavor, make sure your ground turkey includes dark meat. Avocados not in season? We love Wholly Guacamole’s packaged organic, chunky avocado. Simply substitute 1 cup for the Haas avocado called for in this recipe. In a medium bowl, toss together the avocado, bread crumbs, and garlic, until just combined. With your hands, mix the above mixture into the ground turkey, taking care not to mush the avocado too thoroughly. With your hands, form the mixture into 6 patties, and grill or broil until done (burgers should reach an internal temperature of 165 degrees F).